Three levels of dirt in a single pedal with excellent onstage switching options. Versatile switching. Two overdrives in one housing. Wide range of tones. The cut knob is a bit fiddly. 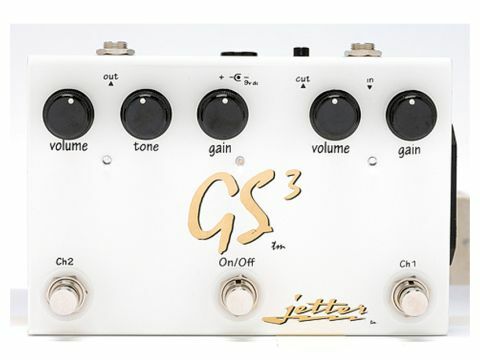 Like its sister pedal, the Jetdrive, the GS3 has two channels that can be used independently or cascaded, with each one having a unique voice and gain structure. More flexibility is provided by a third footswitch that operates an overall bypass regardless of the on/off status of the channels. Each channel is capable of producing usefully different sounds. "With two channels cascaded there's a huge palette of full-bodied overdrive available." Both function nicely as clean boosts and, while channel one features the milder overdrive and a rear-panel 'cut' knob that controls presence, channel two is higher gain and is voiced not unlike a Marshall 'Plexi'. With two channels cascaded there's a huge palette of full-bodied overdrive available.